My famous furrend Sparkle has coined the phrase Smacky Paws of Doom. That works for the majority of cats but not for me. Behold my Smacky Claws of Destruction. Yes, our claws are weapons of mass destruction. 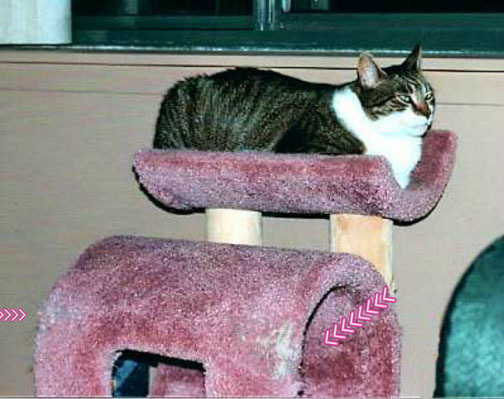 Some of us, like my half brofur who came before me, use them to destroy their cat trees. Some use them to cause destruction to carpet, sofas, floors, you name it. Here's what I use my Smacky Claws of Destruction for. Looka! I see a drop of blood ready to spill! SCORE! I barely grazed TW's hand with my Smacky Claws of Destruction and managed to draw blood though not as much as I would have liked. Yes, she's still fooling around with that Super Mackerel setting so you can see every dried out pore in her ancient hand. I have super sharp claws cos no one has the onions to trim them. The peeps wouldn't try and the last 2 vet techs wouldn't touch them. Nobody wants to mess with purrfection. No furniture was scratched during this photo shoot but I can't say the same about TW. I must give kudos to Nicky, one of the cats that came before me. He did some good work. I understand he totally ruined a couple of chairs and a carpet in the old house. Here is the cat tree he was working on. Can you believe how small and pitiful that cat tree is? Poor cat—that was the only furniture he had too! What do you use your Smacky Claws of Destruction for? Do you let your peeps trim them? Wow CK, theese ones sure are smacky paws of destruction! My Human has an easy time of cutting my nails...I am a very easy-going guy. But with my Human's first kitty Doogie...she had to put a little Hannibal Lecter mask on him so his eyes and mouth were covered because he went nuts. Not that we are suggesting TW try this with you...are you still my furrend? It may have been small....but it was PINK! Paw-pump!!!! Like Prancer Pie's mom, the Human is not very appreciative of my hard work on redecorating. You'd think she'd be grateful I don't ever scratch HER (not on purpose anyway). Hey, it wasn't pretty, but the Giant's beat the Sox for ya tonight. Oh my dear. Such lovely claws, but you shouldn't use them on the humans! I only use my claws on clothing - when Rumblemum tries to walk away before I'm done with my scritchies I'll catch her sweater with my claws. Yikes a pawdicure....??? No way. 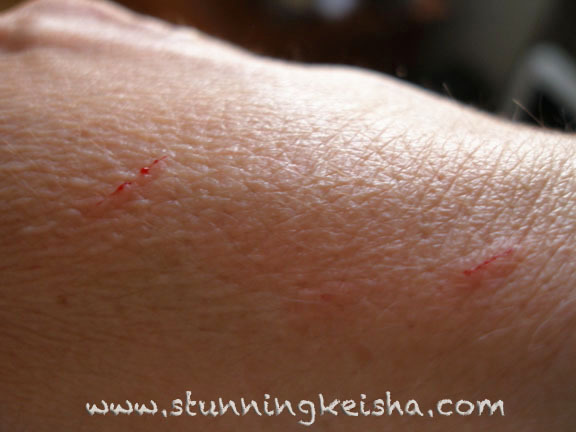 Keisha you are indeed purrfection and we can see you use your pawsome smacky paws of destruction with great expertise. Have a wonderful Wednesday. Audrey is working on the wooden parts of the sliding glass doors with HER claws. Doesn't seem to go for furniture, though. I was adopted with my front claws already removed. So I make up for the lack of claws by biting. I guess you do both, right? You have a magnificent set of claws, CK. Those are fearsome claws, CK. With claws like that to wave around, it's a wonder you ever have to bite TW to keep her in line. The threat of those things would have our head peep giving you anything you wanted. I don't know CK. All of the Farm cats get regular trims whether they like it or not. 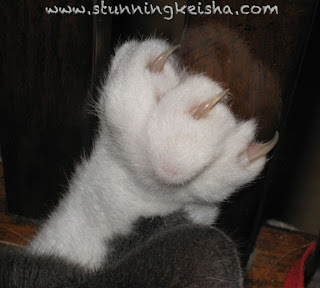 Your claws look very mighty, CK! My boys don't like nail trim but they let is do. nicki...dood....hole lee mackerull ona flounder samich...iz ewe ree lated ta de o'cat familee...we look enuff a like ta bee brotherz...way awesum !!!!! If the woman tried to trim our claws, she would have to go to hospital to have more bloods put in. CK your claws are soooo sharp ! Hey, CK, Mom just found out that PETSMART have a cat claw trimming option in their grooming department. Want to give it a try? We can direct you to the Petsmart near us and meet you there! Oh, and Pee Ess: my humans never try to trim more than 2 claws at a sitting with any of their cats. Whoa those things look pretty dangerous. KKMM used her claws to claw the couch in the mornings. It was her way of saying feed me! And Honey D. did scratch me once. I walked away with her food bowl and she ran up behind me and scratched me good on the leg lol. Goodness CK, those are lethal weapons fur sure! CK, you are making us all look bad here! My human can trim ALL our claws, all by herself! Even Binga, although she is a little testy. And trim them she does, at the very lightest poke. We are total wimps compared to you. Our Mom is so sad because the last scratch Abby put on her is nearly healed and barely visible. Like Abby it is disappearing. YIKES! Those claws of yours are fearsome, CK! Moosey is pretty good about having his trimmed. Thank Cod. CK, I use my claws to scratch the carpet which makes the mom mad. So she trims them. Meanie. CK, we always thought you so tender, gentle and sweet..now, we can't help but think of you with those bastille-type weapons of destruction?? That can't be true..you must have had a stand-in..
CK, yours is our last thank you of the night..we can only do a few at a time and Tom had so many friends we want to thank for their kind words when we lost him. He was in awe of you! When you became the first feline pope, he bended his knee and thanked heaven. We know he's there now with all the angels and the friends who have gone before. We're sure they've seen to it he has a watering hole with his name on it. I'm sure he would agree..friendship is everlasting, girlfriend..
Yeah, so, sorry about that 12-1 thing. What can you do when no one on the team can hit a f&#%$@* pitch (and evidently no one on the team could pitch today either). Every 2 weeks or so, Mommy puts us on her lap and clips our nails. We are used to it so we just sit quietly on her lap while she clips. Once all of use are done, we get treats! Well, that is how it's like with all of us. Then there's Tutu. Ah, SHE refuses to cooperate and will bite Mommy as Mommy clips. Sadly for Tutu, Mommy has leather for skin and isn't perturbed by the biting. Sadly for Mommy, teeth can make holes...even on leather. My mommy never got to clip a claw after Robin 19 years ago except for the front ones, 3 at a time on Admiral. Me, nope...no can do. Stay away. Hi, you are our neighbor in this weeks Wordless Wednesday so thought would drop in to say hi. Barney doesn't like his claws clipped and sometimes he is a bad boy do. Hi darling. Your claws, they are.....exciting. My staff calls them my "talons of pride," and no, she does not trim them.